Gregory Shamus/GettyLeBron James has talked about playing in the NBA with his son, which means he would play at least another five years. LeBron James recently said the best accomplishment of his career would be to play in the NBA with his son, LeBron James Jr.
James Jr. is a highly touted basketball player who already has college scholarship offers despite still being in Middle School. He could potentially be eligible to enter the NBA in 2023, a season in which LeBron would turn 39. 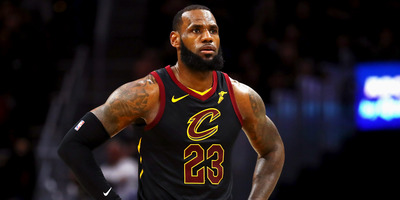 LeBron James is one of the most decorated basketball players of all time, but in a recent appearance on Uninterrupted, when asked what would be his greatest achievement as a basketball player, LeBron did not name a trophy or individual or award. “If I’m on the same court as my son in the NBA,” LeBron said. “That would be number one in my lifetime as an NBA player. LeBron James Jr. is a bit of a basketball prodigy himself and has already received scholarship offers from Duke and Kentucky.So if the NBA does go back to allowing players to enter the league straight from high school, James Jr., who is in seventh grade, would be eligible to enter the NBA in five years, for the start of the 2023-24 season. LeBron Sr. would be 38-years-old by then, and with a lot of mileage on his body, but given that he is a physical marvel who shows no signs of slowing down, it is entirely possible that LeBron will still be playing in the NBA five years from now.